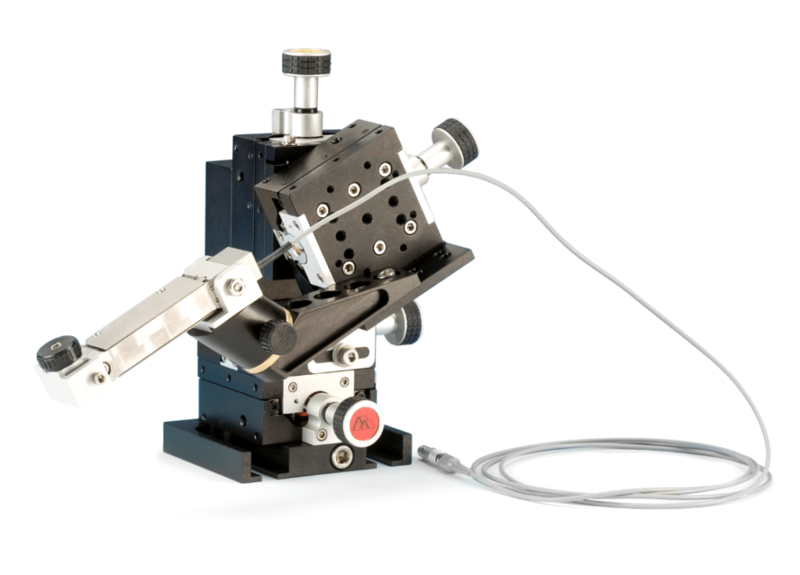 The piezo solution switcher uses a high-speed piezo flexure guided nanopositioner to move pipette tips in solution switching applications. It can move an electrode tip across a 5 µm thick theta glass septum. This system is ideal for measuring cellular response to drugs or other elements in solution. Piezo movement can be triggered by either input from common recording amplifier equipment or by Siskiyou software via a LabVIEW™ interface that can control distance, frequency and dwell time. The piezo also includes the piezo amplifier box and the Input-Shaping® board, which significantly reduces pipette tip vibration and can be programmed to virtually eliminate resonances from your specific system. 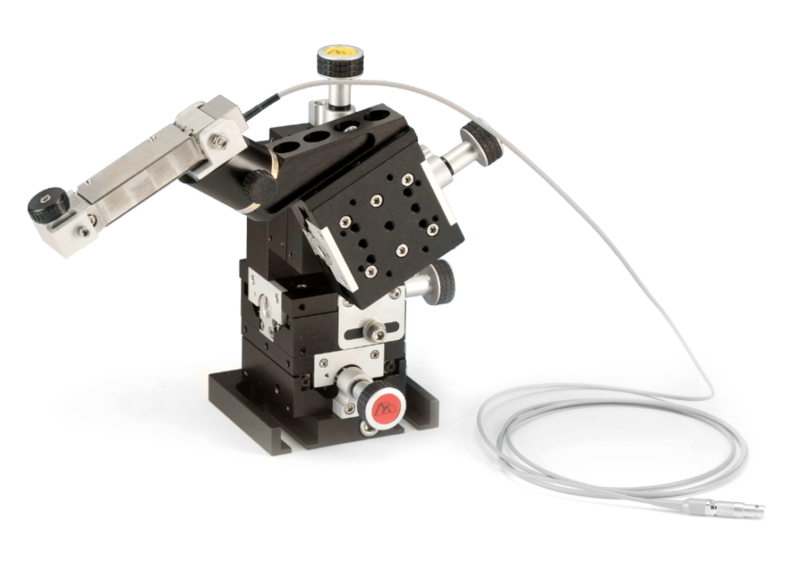 The piezo flexure guided nanopositioner is mounted to our ultra-stable MX1640 crossed roller micromanipulator. The MX1640 has 20mm of travel in all four axes. 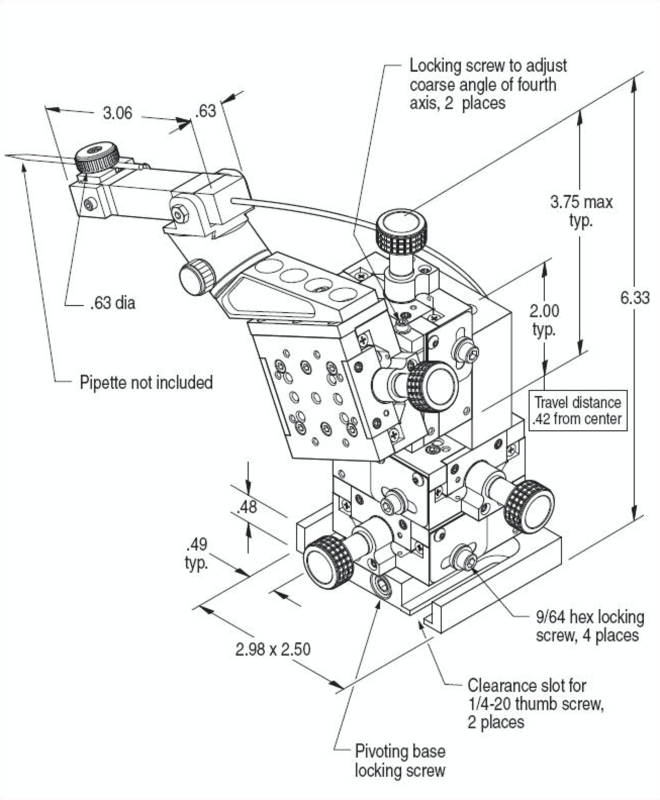 The fourth axis can be set at any angle to select the desired approach angle. This adjustable fourth axis incorporates our MXC-45 to allow rotation of the piezo/pipette assembly up and out of the experiment for easy glass replacement. The base of the MX1640 also has a built-in coarse adjustment for rotation of the entire manipulator, or can also be used with our MX-RS rotation stage for more precise motion.